President Donald Trump offered a simple solution to the National Football League as it deals with an upswell of National Anthem protests by professional football players—set a rule prohibiting kneeling during the National Anthem. Trump sent his suggestion in a Twitter message on Tuesday morning. Trump’s message comes after two days of protests by more than 200 NFL players who kneeled when the United States National Anthem was performed. 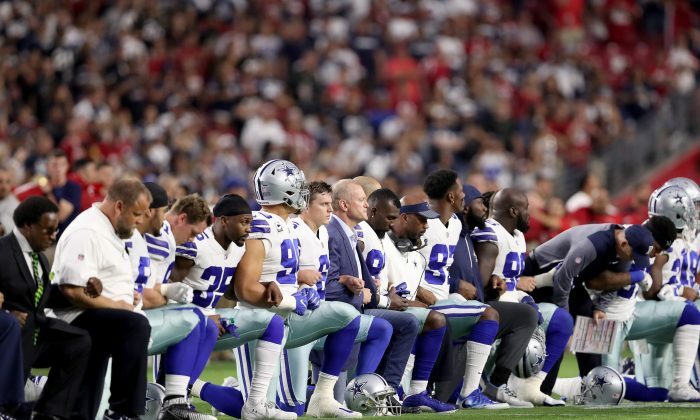 The protests intensified after the president said that players who kneel during the National Anthem should be cut from their teams. The first NFL player to kneel for the National Anthem was Colin Kaepernick, who said he was protesting racial injustice and police brutality. Trump has said that he takes issue with kneeling because it is disrespectful to the United States and the flag. Broadcast ratings for Sunday Night Football on Sept. 24 declined compared to last year. According to Deadline, the ratings for “Sunday Night Football,” which saw the Oakland Raiders play the Washington Redskins, dropped 11 percent from last season’s Week 3 matchup, which saw the Chicago Bears play the Dallas Cowboys. This Sunday’s Redskins-Raiders game averaged an 11.6 Nielsen rating, which means 11.6 percent of households tuned in for the game. The ratings are also an 8 percent drop from last week’s “SNF” game between the Green Bay Packers and the Atlanta Falcons. Ratings for NFL overall have continued to decline as well. Last season, a common explanation for the drop in ratings from executives was there was an unprecedented interest in the U.S. presidential election. Some polls, however, found that the protests during the national anthem were a primary factor in declining viewership. “Twenty-six percent of those who watched fewer games last season said that national anthem protests, some of which were led by Colin Kaepernick, were the reason,” ESPN said, citing the survey. The Epoch Times contributed to this report.